Dollar High Box was kind enough to send me not one, but three of their monthly subscription boxes to check out and review. Unlike some other monthly subs, DHC offers customers 3 different levels, starting at $1 per month (+S&H). The first thing we noticed when we got our DHC shipment was the elegance and simplicity of their packaging. They use classic brown boxes / envelopes that sport a DHC stamp. This ‘all-natural’ look is reflected in the products they choose to include in each package. Yes there are some flavored papers and other not-so-natural novelty products, but there is a clear bias towards all natural hemp products. 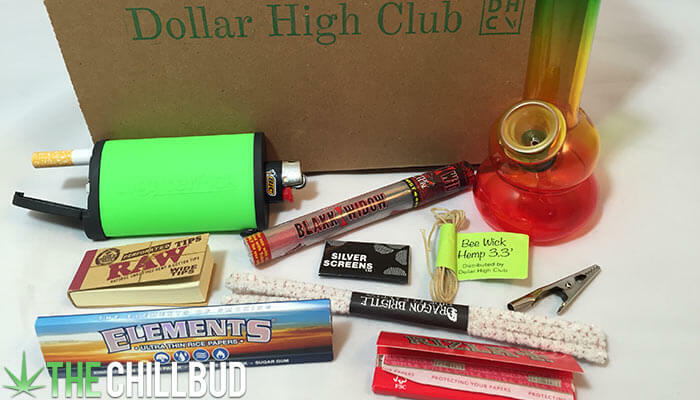 Let’s dive right in and break down what we got in each Dollar High Club box. 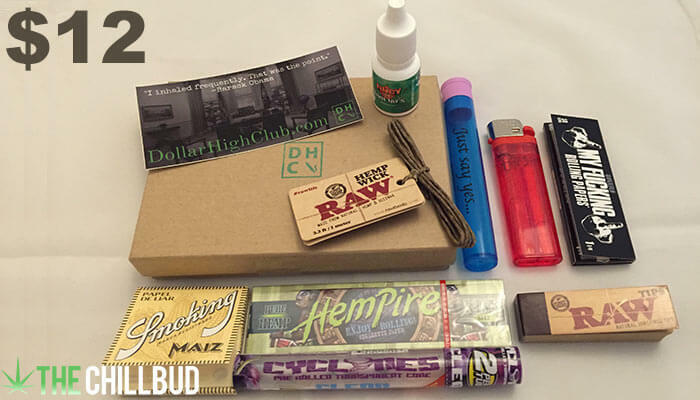 This is their entry level box, it contains the essentials: Papers, matches, tips and some hemp wick. The All-Natural subscription is just $1.00 USD per month, plus $2 shipping within the US ($3.25 outside the US). Quite frankly, this is a great deal. Local smoke shops sell these same MOON papers for two to three dollars alone. Throw in the hemp wick and all natural RAW tips and we have ourselves a bargain! 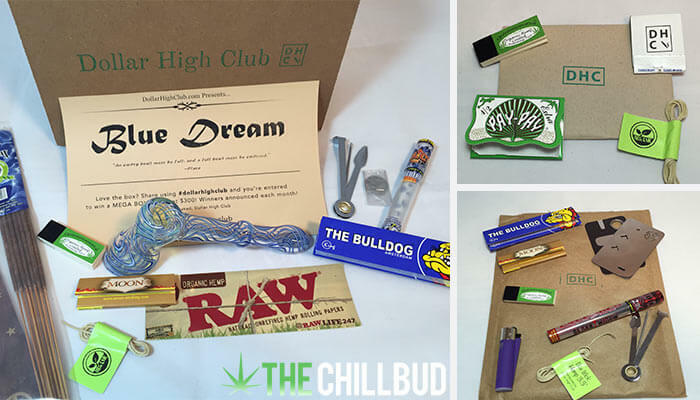 The mid-level box containing: A variety of papers, a lighter, a doob tube, tips and some flavor drops. The Connoisseur box costs $12.00 USD per month and ships free within the US ($5-9 shipping outside the US). This box contains some goodies, but overall it seems a bit lacking for the price, at least when compared to the other two options. 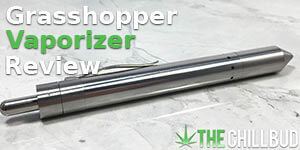 I view this as more of a gift option, an affordable way to let the smoker in your life know you care. 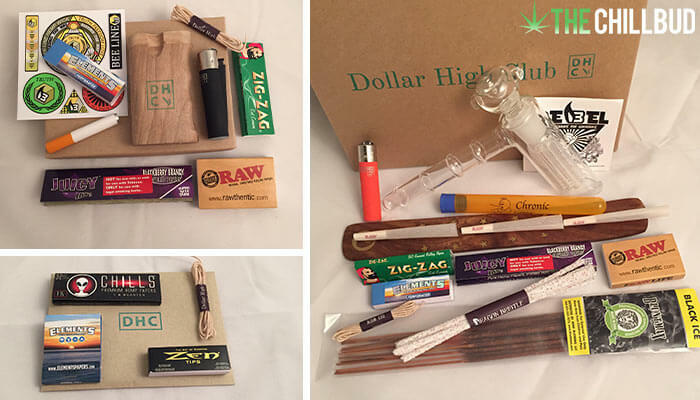 Here is their ultimate stoner goody-box containing: A variety of papers, a mini clipper, hemp wick, tips, incense, a doob tube, pipe cleaners, a glass screen and a glass pipe. The El Primo box comes in at $30.00 USD and ships free within the US ($7.50 – $13.00 outside the US). 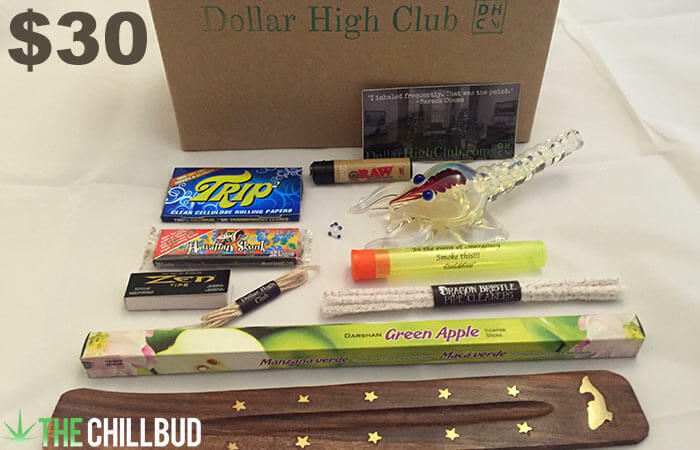 Here is the biggest and best Dollar High Club subscription box. You get your money’s worth with the pipe alone. All the goodies in this box made it feel a bit like christmas morning, I would highly suggest starting with this box if you are going to try DHC. What I really loved about DHC was that every single option is filled with everything you need to puff down. 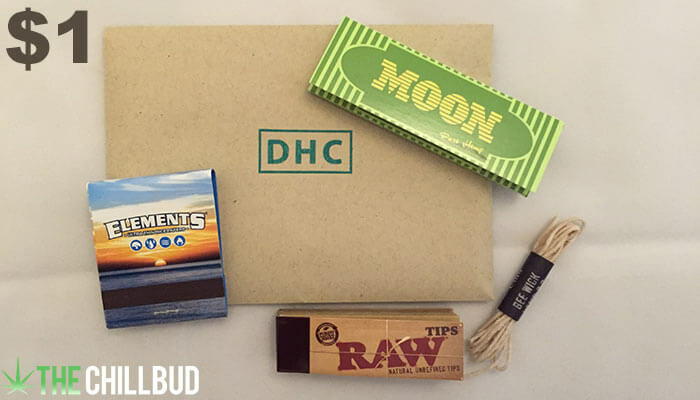 Papers, fire source, tips and hemp wick are included in every box. If you are a low-maintenance smoker and just enjoy rolling one up when the mood strikes, the All-Natural box option seems like the way to go. For a few bucks a month you can be sure you always have papers, tips, and hemp wick on hand and delivered right to your door. 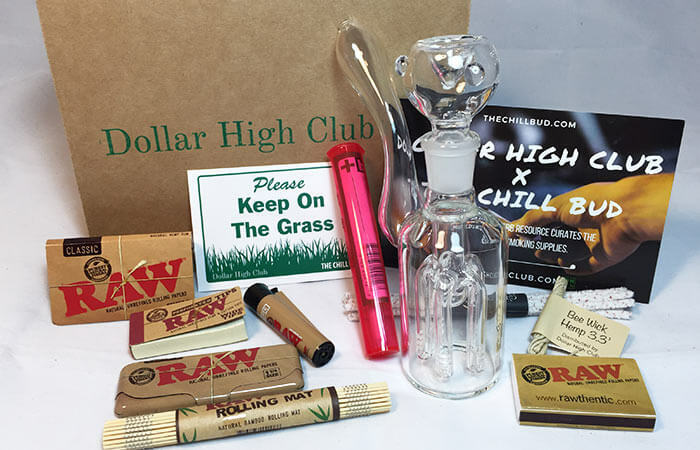 The El Primo box was easily the coolest, a brand new glass piece every month plus all the assorted goodies that every toker loves. The addition of the incense sticks was a great call, it makes it feel like you are walking into a smoke shop when you open the box. But best of all, you really feel like you getting a good bang for your buck with this $30 box. 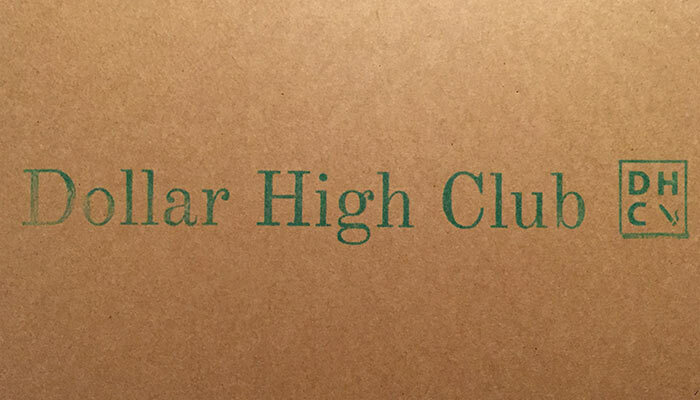 Lastly, the Dollar High Club is the only ‘smoking’ subscription box that is shipped the day after you order it. Unlike some others that only ship once per month, your DHC box is shipped immediately after you order. This won’t affect long-term subscribers really, but it makes for a much more exciting experience for first-time or one-time customers.